Apartmány Spiežovec sa nachádzajú v apartmánovom dome Spiežovec v horskom lyžiarskom stredisku Donovaly. 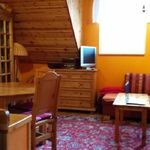 Apartmány sú komfortne zariadené so samostatným elektrickým kúrením a ohrevom teplej vody. Majú plne vybavené kuchynské linky, vlastnú kúpelňu a WC. Základné vybavenie - TV so satelitom, rádio, chladnička, mikrovlnná rúra, rýchlovarná kanvica, posteľné prádlo, uteráky, čistiace prostriedky. V apartmánovom dome sa nachádza reštaurácia s denným barom a letnou terasou, sauna, výťah, úschovňa lyží, záhradné posedenie s grilom a bezplatné parkovisko. V prípade pobytu na 4 a viac nocí poskytujeme zľavy - vyžiadajte si špeciálnu cenovú ponuku. Rezervujte si ubytovanie teraz, behom jedného pracovného dňa Vám Apartmány Michalka Spiežovec Donovaly pošle správu o úspechu rezervácie. Priemer hodnotenia Apartmány Michalka Spiežovec Donovaly je 9.3 z celkom dosiahnuteľných 10 bodov, na základe 33 hodnotení. "The place is fully appropriate for the 20th century traveling family with 2-3 adults and max. 3 or 4 children. Unfortunately, for more adults, some should sleep above the bathroom and the toilet where the internal height is about 140cm, so no adult can stand up there. This place has unfolding spare beds also used as chairs. The whole upper sleeping place is great for children, but adults may find it somewhat uncomfortable to sleep in. You have to pay the remaining fee upon arrival in advance and in cash, no other means! We did not meet the landlord in person, only the cleaning lady who brought the keys that we had to leave on exit in the restaurant. The small bathroom has a bath. However, the hot water provided centrally in the building may run out in the evening if the house is full. We could have appreciated a small shelf above to washbasin to place our toothbrush, toothpaste and soap on it. Both the fridge and the microwave have electric pipe plugs and due to the Slovakian double electric outlet type it seems impossible to plug in both simultaneously, we had to use a power strip of our own to be able to use both. The 21th century traveler typically has some more, already natural demands that the Michalka apartment cannot meet, unfortunately. The apartment is advertised with free WiFi, but it is valid only in the restaurant on the first floor (about 10 Mbs symmetrical). Due to the thick walls and ceilings, there is absolutely no chance to joining the restaurant WiFi in any apartment, so the apartment description should be adjusted accordingly as the current one is misleading, there is no WiFi/internet in the apartment. The LCD TV is a 20 inch/50 cm Matrox model with no HDMI connectors, only RCA, SCART, S-VHS and VGA inputs. Talking about the restaurant, in the evening of our arrival (Thursday), we tried to have dinner there and were promised twice by the staff to be able to eat eventually, but after two hours waiting we could only get powder vegetable soup. The staff also felt it embarrassing and invited us for the soup, so we did not have to pay. It seemed as if the restaurant had thought it was not worth cooking on an unfrequented weekday, but it was already in full steam two days later, on the weekend. Unfortunately, despite the neighboring Penzion Vodar being advertised having a restaurant, it has not. The next days we ate at Pivovar in Donovaly center instead. Although the apartment house may seem in walking distance to the skylift at Fun Park on the map, the hills in-between necessitated using the car to get to both Zahradiste and Nova Hola." "The Spiežovec Donovaly is an apartment house is a 4 storeyed building that consists of apartments owned by separate individuals. Therefore, the evaluation may refer properly to the entire house, only for the apartment, #5 on the first/ground floor in our case. 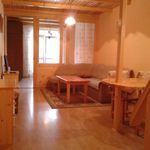 The Michalka apartment is a comfortable one with nice view to the surrounding hills with a separate, very convenient bedroom with a double bed and a living room shared with a wall mounted dining table, a small, but well equipped kitchen, and another sleeping place above the bathroom and the toilet, where you can climb up the stairs. Electric heating works well, although the upper sleeping place is indirectly heated from the lower level. An unfolding clothes-horse is also available and good to dry wet sky clothes overnight." "A szálláshely tulajdonosa félrevezetett minket. Egy másik szálláshelyre próbált irányítani, ahol se étterem, se szauna (mindkettőt írásban ígérte), se a velünk utazó másik baráti család nem lett volna jelen." "Mi heten voltunk egy szobában (kényelmesen elfértünk) és mivel a fütés, meg a bojler időkapcsolóra van kötve voltak gondok a melegvíz mennyiségével!" "Barátságos, kedves és a hóesés miatt (is) gyönyörű környezet. Kedvező árak, sokrétű kikapcsolódási lehetőség." Kvalita služieb ubytovacieho zariadenia Apartmány Michalka Spiežovec Donovaly je na vysokej úrovni, dosahuje skóre 9.1/10 podľa hodnotení a názorov hostí.